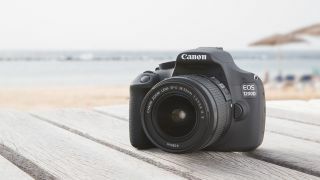 The Canon EOS Rebel T5, which is also known as the EOS 1200D, is one of the most affordable options around if you're looking to crack your way into DSLR photography. With such a keen price tag, it's no surprise that Canon has concentrated on providing it with a sound core rather than filling it with lots of options you may never use. That said, when you consider that it provides you with access to a huge system of lenses and accessories, you can see why it's as popular as it is. With thirty-years' worth of compatible Canon optics, and many third-party options from the likes of Sigma, Tamron and Samyang alongside, there's a good chance that if you can't find the lens you want at a price you're willing to pay, it simply doesn't exist. So what do you get for your money? At its heart lies an 18MP APS-C CMOS sensor, which Canon states is good enough for A2+ print sizes. You also have a DIGIC 4 processing system that allows for not only Full HD video recording but 3fps burst shooting too, and this also enables a handful of Creative Filters such as Grainy B/W and Toy Camera to give you instant effects for all your creations. Other features include a 9-point AF system and an optical viewfinder which presents a natural view of the scene. This is great for those who are put off by the electronic viewfinders in some other cameras, which can suffer from lagging. There's also a 3in LCD screen, which sadly doesn't tilt around to all sorts of positions – but then at this price, we wouldn't expect it to. Canon has very much kept the first-time user in mind with the EOS 1200D, with the Feature guide built into the camera to give you a better idea of what everything does. You can even use a free EOS Companion app developed by Canon that will bring you up to speed on things like lenses, and provide you with tutorials to get you honing those skills in no time. Fancy seeing the best deals on the Canon EOS 1200D? Just scroll down below!